The janitors at Welcher Elementary know a secret, and it's draining all the smarts out of the kids. Twelve year-old Spencer Zumbro, with the help of his classmate Daisy Gullible Gates, must fight with and against a secret, janitorial society that wields wizard-like powers. 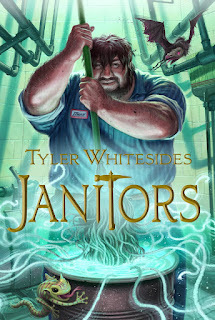 Janitors by Tyler Whitesides is a fun, imaginative story that is perfect for middle schoolers (and those of us who also enjoy such a read). Perfect for reading out loud, this book is a great choice for family bedtime snuggling and school reading time. 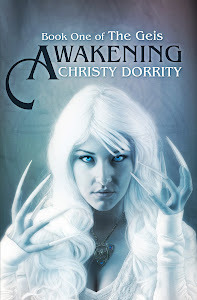 With a boy and girl heroine, both genders will get a kick out of Spencer and Daisy's antics. The clever theme of being a chameleon is woven throughout the story--everyone tries to make themselves out in the best light, but in the end, everything goes better if they tell the truth. After I finished Janitors, I went back and read the opening scene to marvel at the way the author incorporated important objects and people in the very first page that play a large role later on. What I thought was simply set up to show what his life before meeting the Janitors actually set up the entire story. The magic system in Janitors is intriguing. I'd like to see a bit more creativity in what the Janitors can "glopify". Riding broomsticks isn't a new concept for kids, afterall. I hope the author pushes the limits of his magic system in the next book. The ending sets up the next book, Secrets of the New Forest Academy (out Fall of 2012) and promises an excellent adventure.